August 12th, 2011 brings a remarkable thing to my home of Nova Scotia. One of the most amazing beauty stores opens in our local Halifax Shopping Centre. This store’s opening has been a rumour for the past 5-6 years. When I learned on April 2nd of this year that the rumour was finally a reality I was over the moon with excitement! Up until now I have to be honest, I’ve only ever been in a Sephora 3 times. 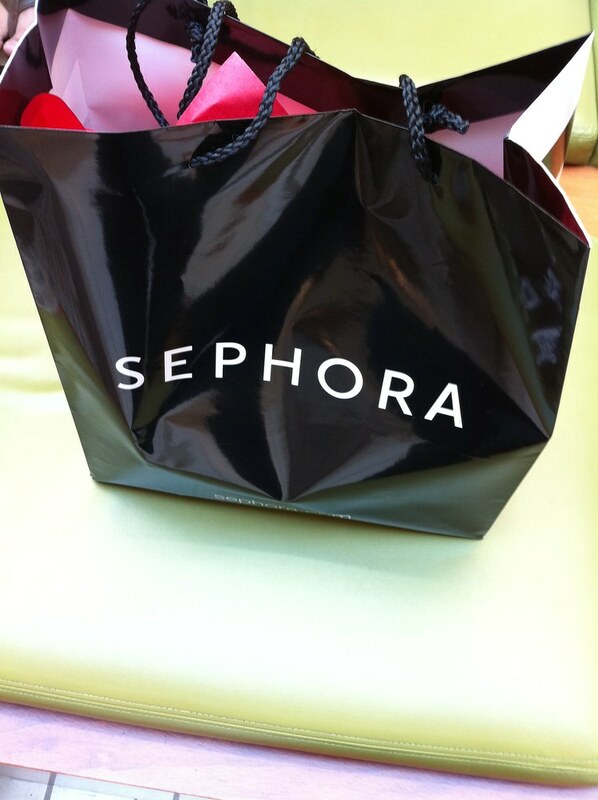 I have since before longed for Sephora from afar. I have read more reviews on products sold at Sephora for numerous years only ever having only enough money while on a trip to Toronto’s Eaton Centre. They carry more than 250 brands as well as their own line. 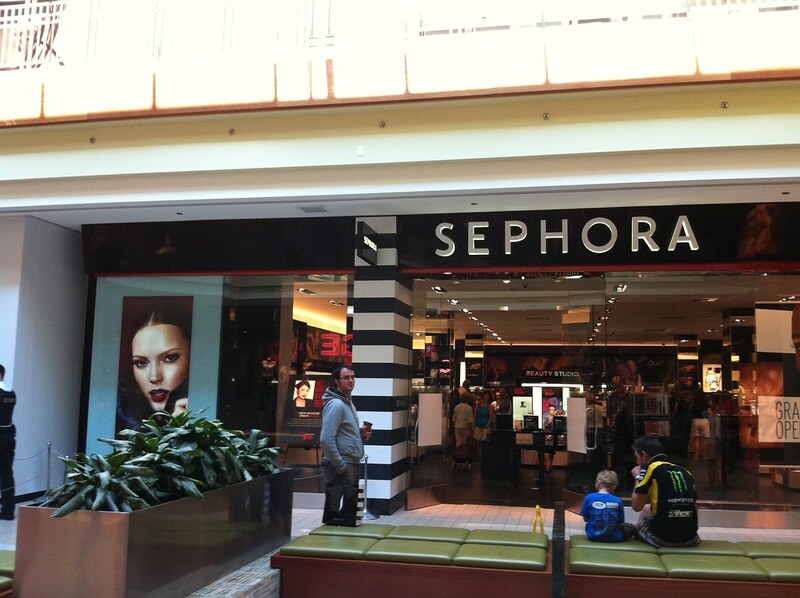 Many locals don’t know what Sephora is, so I’m going to elaborate a bit. 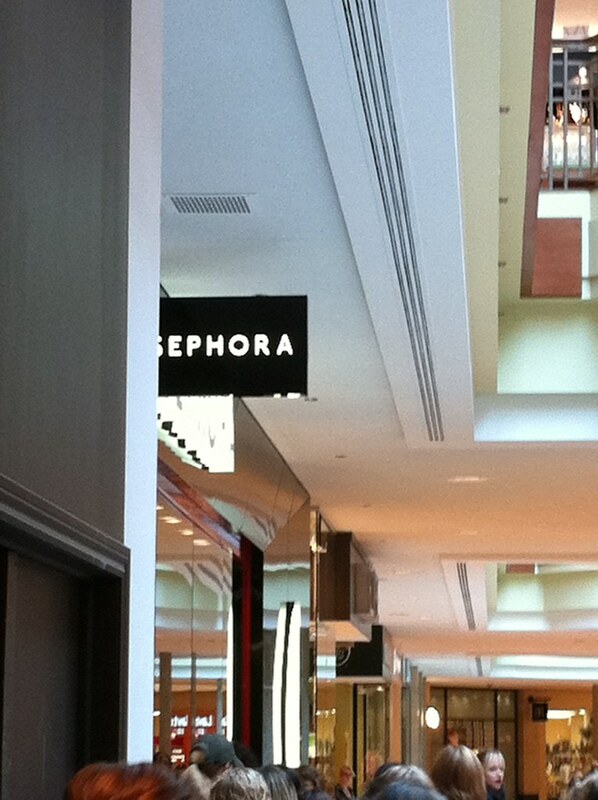 Sephora has been around since the 70’s (I know! Shocker!) and is actually based out of France(another shocker!). It was bought by the LVMH group. What group is this you ask well to be honest I was happy to learn that the LV stands for non other than the good ol’ French fashion chic Louis Vuitton. The Louis Vuitton and Moet Hennessy group bought Sephora in 1997 and then shortly opened the first USA store that very same year in New York. It’s been growing in North America ever since. 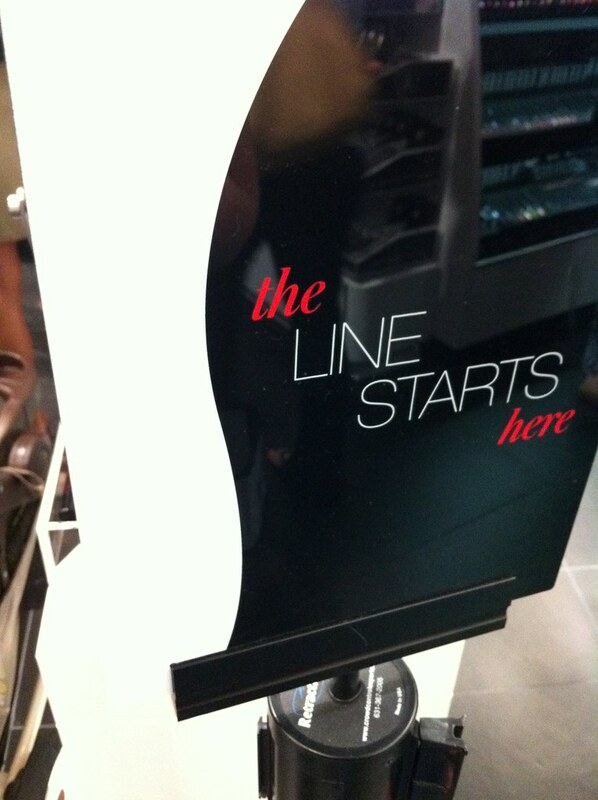 So enough about Sephora’s history. What about the new store in Halifax? What are my thoughts? Feelings? Opinion after 5 years of rumours and waiting? It’s everything I hoped and dreamed for. I arrived with MrHix (I’m lucky to have such an amazing husband! 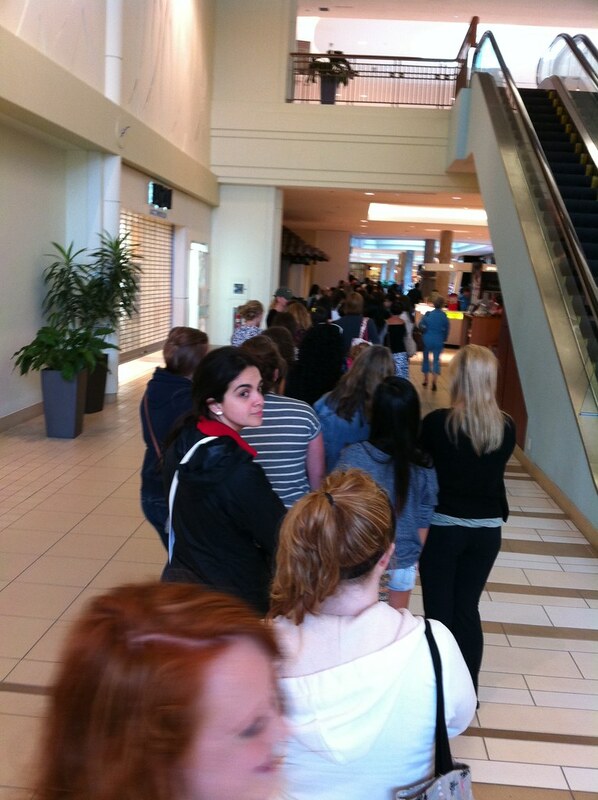 )at Halifax Shopping Centre at 9:15. 15 minutes before open and was greeted by a massive line. (picture to the left)I know i could have arrived earlier, but why? I wanted to take my time in the store so it wouldn’t matter if I was first in line or last. I just knew I wanted to be there when the doors opened. Soon after entering the line we estimated about 150 people were in front of me and then before I knew it about 20-30 more were behind me. 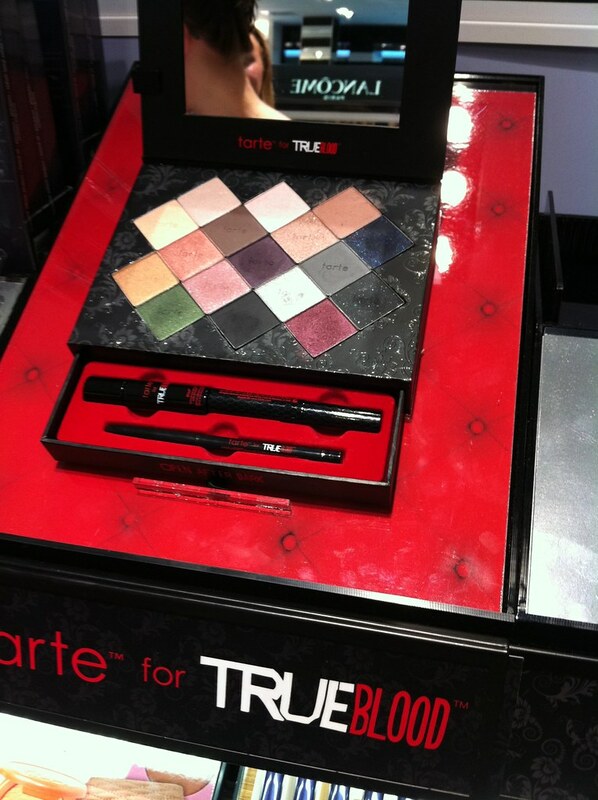 It was as if a fairy tale was coming true for all the makeup lovers in town. We all wanted to be there. We all needed to know it was real! No longer a rumour! 150 people later and I was at the doors! Finally! It’s real! It’s tangible. Beauty products at my finger tips! No longer enjoyed from afar through internet reviews! 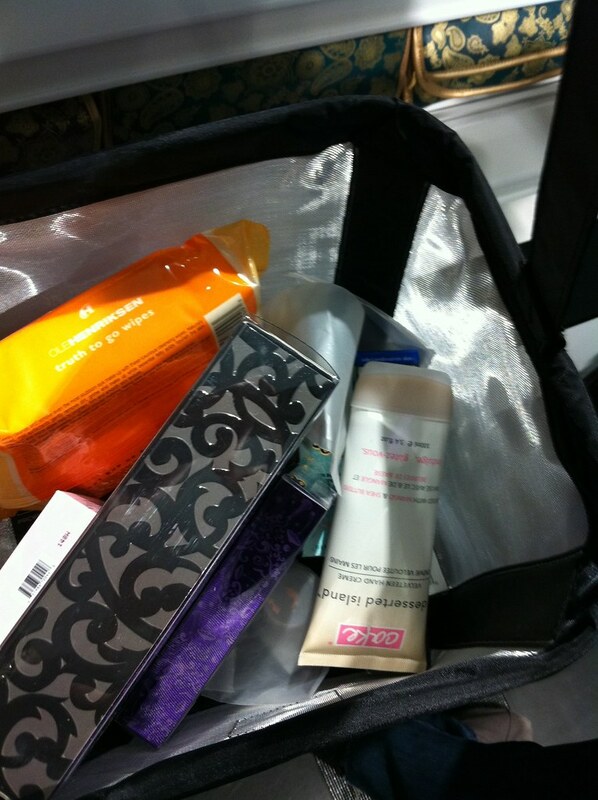 I instantly went for my HG of mascaras, Bare Essential’s BUXOM blackest black mascara ($24). Not only did I pick up one for myself, but I grabbed one for MsJillian as well as an early birthday gift. She unfortunately had to work so couldn’t make it to the opening so I thought I’d bring it to her! 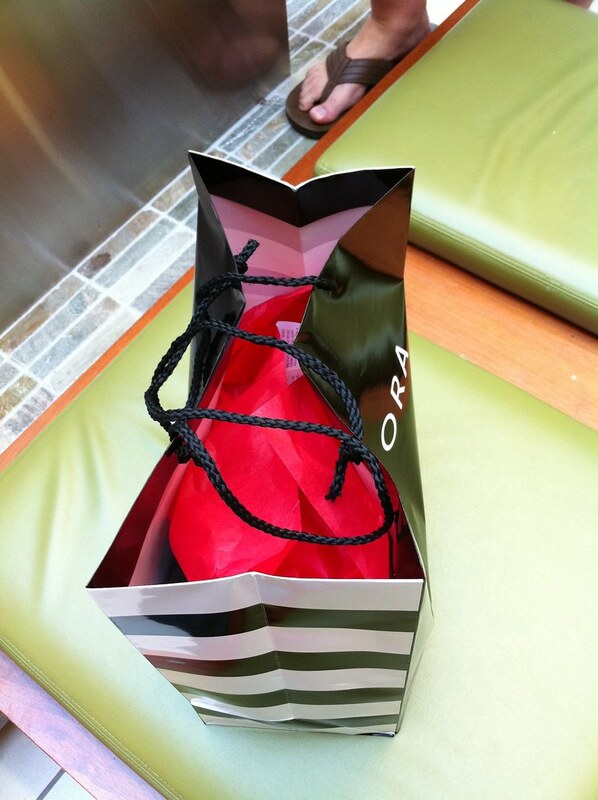 But more on my haul in the next post! This is a review on the store itself. There’s nothing quite like walking into a brand new store. Smelling the ‘new store’ smell as if we had just purchased our very own brand new car. I have seen 100’s of photos and read reviews on other Sephora’s across North America and I have to say though we may not the largest, it definitely is the friendliest! It has a wonderful variety of latest hits and old favorites! Dior, Lancome, Bare Essential’s, Makeup Forever, Urban Deay, Too Faced, Bumble and Bumble, Philosophy, Tarte…. the only thing missing was Bobbi Brown. Needless to say I have had a Sephora list on the go for weeks now. I only had a few essentials, but knew there would be a few add ons. Needless to say come the end of my tour with Brandy my basket was full. She introduced me to at least 4 or 5 lines I had never heard of and at least 6 different products I hadn’t experienced! I will be reviewing what I purchased soon enough. I have always enjoyed shopping for my makeup. Chatting with the reps and learning their tips and tricks as I shop. If you ever want to find out what’s hot, open a magazine. If you want to find out what works, talk to a make up artist or store rep. They’ll break it down for you. After my basket was full I was then on to the daunting task of the lineup for the cash. I entered the line at 10:11am. 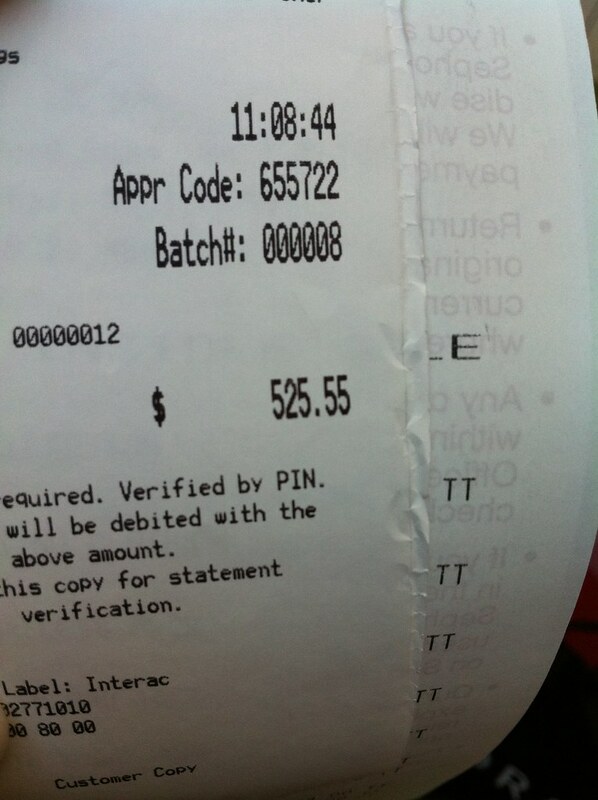 I arrived at the cash to pay for my purchases at 11:04am. Thankfully I knew it would be awhile and the ever patient MrHix waited for me outside the store. It took 45 minutes to simply reach the cash and another 10 to make it through what would be considered the normal lineup. (above) but it was worth it! 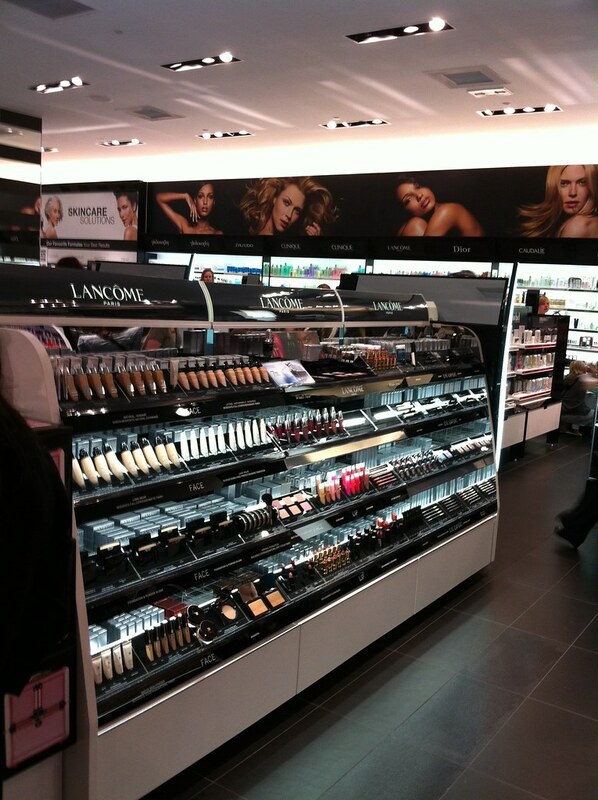 I can honestly say the opening of a big store like Sephora is going to do wonders for Nova Scotia’s economy. It’s also proving that the east coast is ready for the big stores. With Starbucks making a dent in the coffee industry and Sephora making way for amazing beauty products, I can’t wait to see what Victoria Secret and Hollister have to offer up! Here’s to Halifax’s future as a shopping destination for the Maritimes! 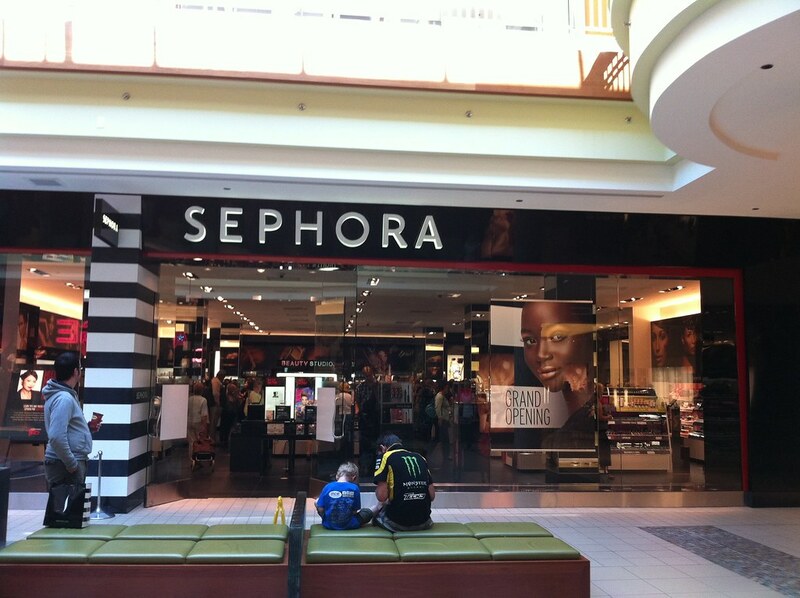 I can’t wait to make my way back to Sephora. Though after that pretty penny, it might be a bit.